i'm happy to be contributing to studio calico this month! you will be pleased to know that presales has started for subscribers and all kits will be on sale for everyone tonight at midnight EST/ 11pm CST. 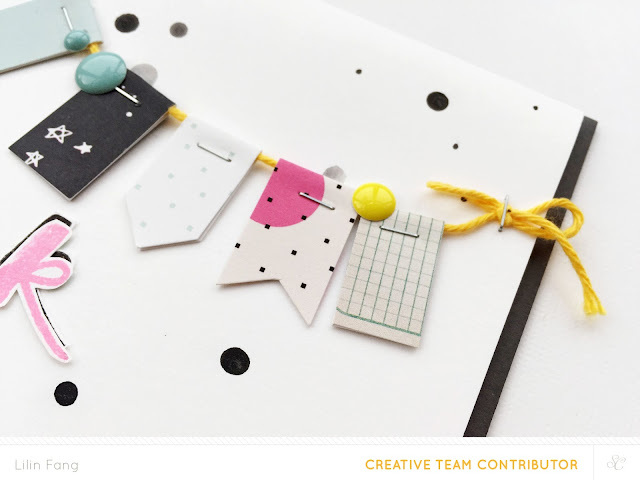 this month, i decided to try something different and worked with the card kit instead! 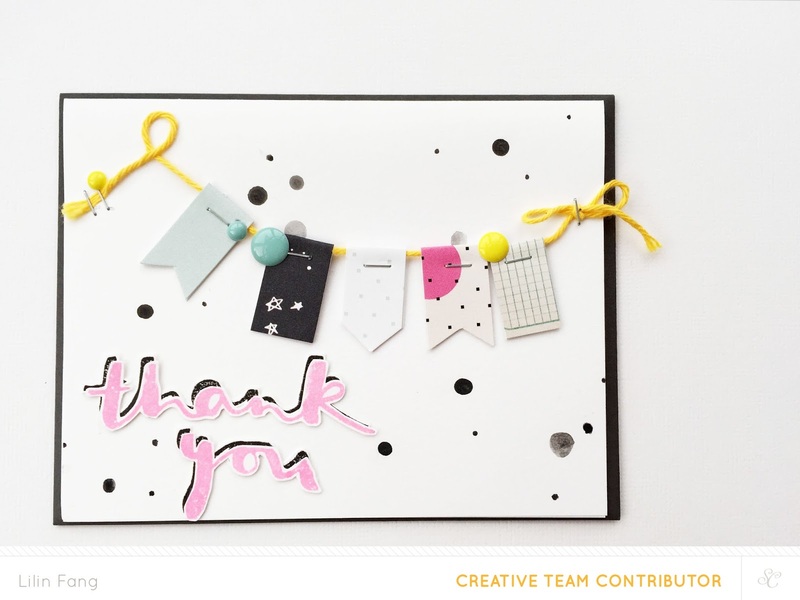 it was lots of fun for me and i am excited to share some cards i made with the main card kit, i do by kelly purkey and hey girl by mama elephant. I am inspired by Wilna to use the color theory ink pad to create a background for my card. 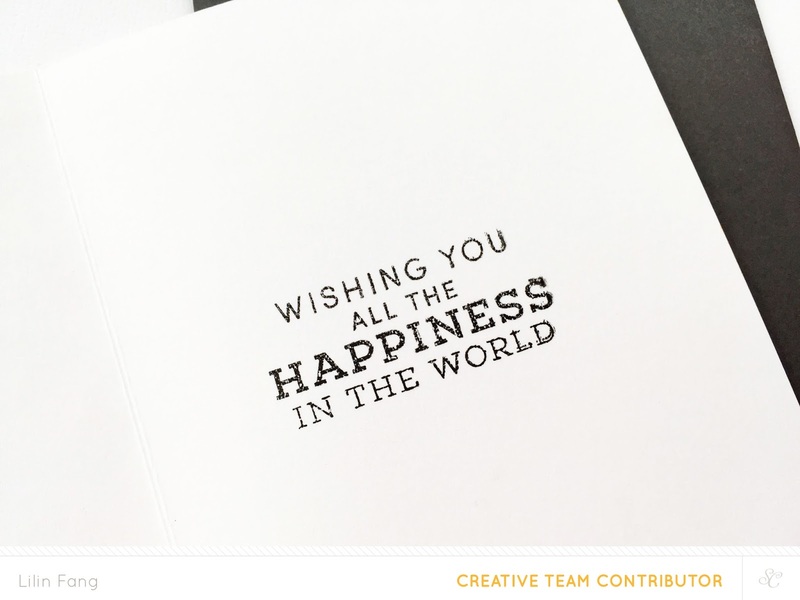 I just press the ink pad on the card and rub it to create a rectangle background. I then fussy cut the stamped bunny and ice cream and adhere them to the card with foam tabs to create some dimension. 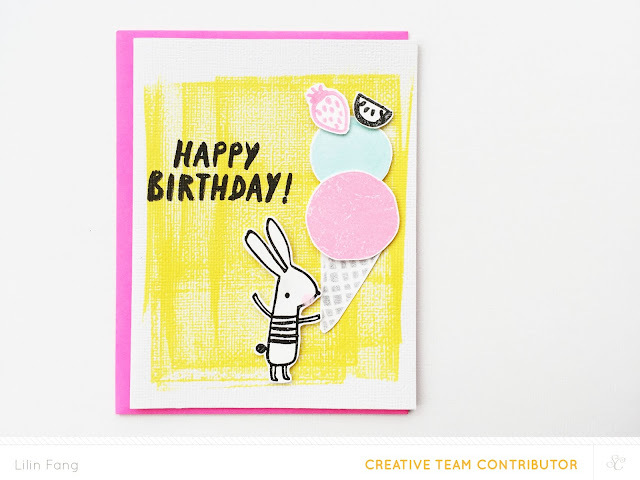 next i stamped happy birthday and added some pink paint on the bunny's cheek (though someone mention it looks like ice cream on the bunny and i agree!). i love colors of the papers in the paper pad so i made a little banner with the different papers. i attached the banners to the twine with my tiny attacher. i also use the tiny attacher to secure the twine to the card. then i added some enamel dots to complete the banner. next, i stamped the thank you phrase in black and pink ink. i then fussy cut and layered them for dimension. to finish off the i added some ink splatters. 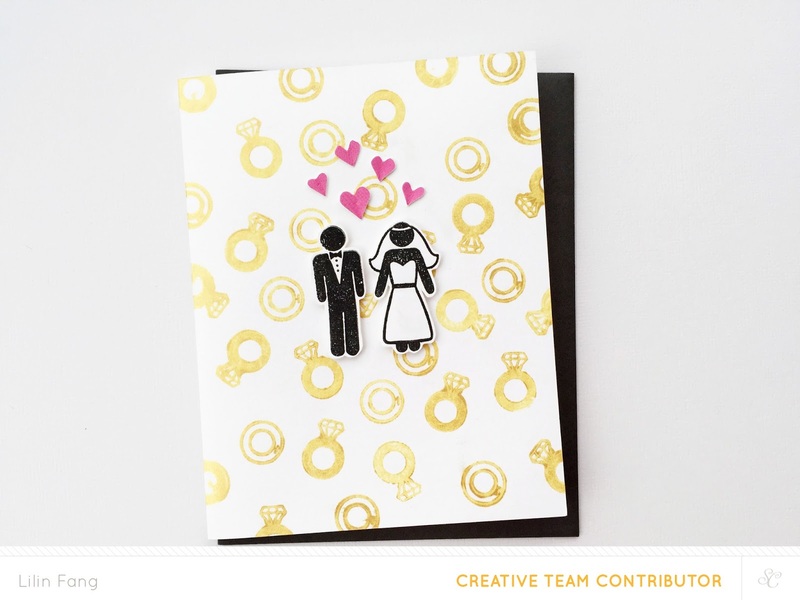 i created a background with the wedding bands and gold ink. then i fussy cut the stamped bride and groom and adhere them with some foam tabs for some dimension. to add some interest and color to the card, i fussy cut little hearts from one of the patterned papers and adhere it to the card. i love that this stamp set has some sweet phrases which i added inside and and the end the card. there are lots of lovely and encouraging phrases on this stamp that i would like to include on my card. so i thought of using the printable labels. i stamped the phrases on some of the labels. then i start to adhere the labels to the card or secure them with my tiny attacher. i also added some of the cute washi tape designed by lizzie mackay (did i mention i am a big big fan of her designs?) and a little bow i made from twine. 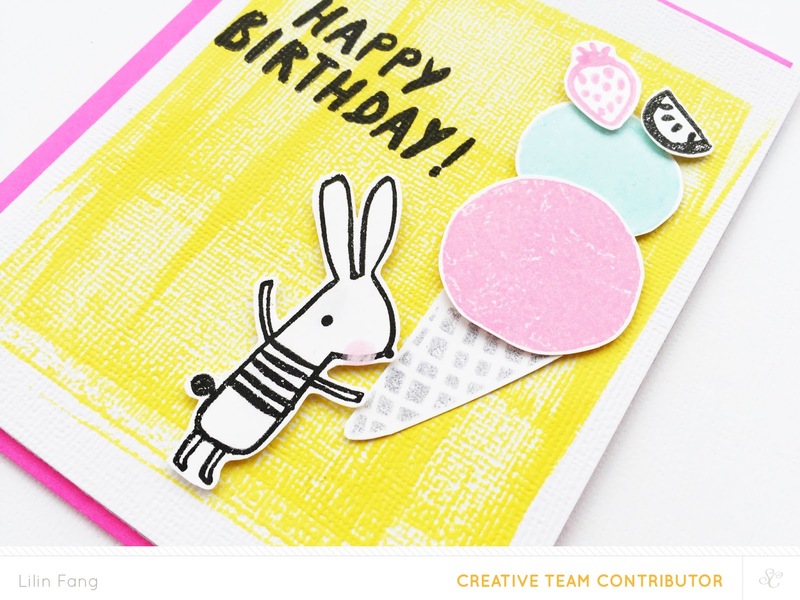 i am crazy about the bunny and ice cream stamp in the card kit this month so i had to create another card with this cute stamp set. for this card, i decided to try stamping with gelatos and boy was i happy with the results! 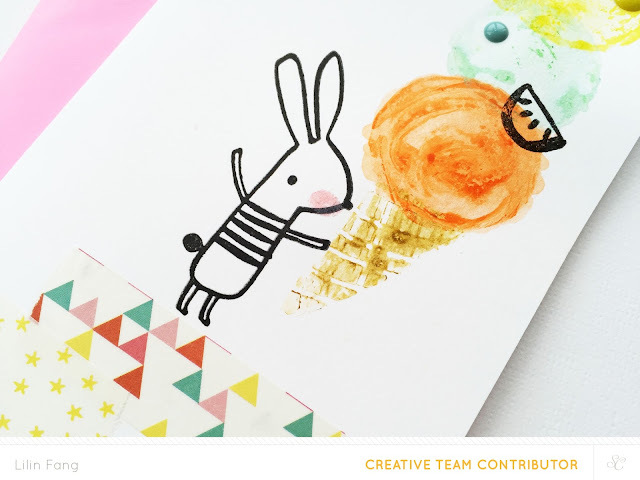 i love the watercolor paint effect and i thought it made the ice cream look like gelatos! :) then i started decorating the ice cream with the fruits and enamel dots (i thought they look like candy!). 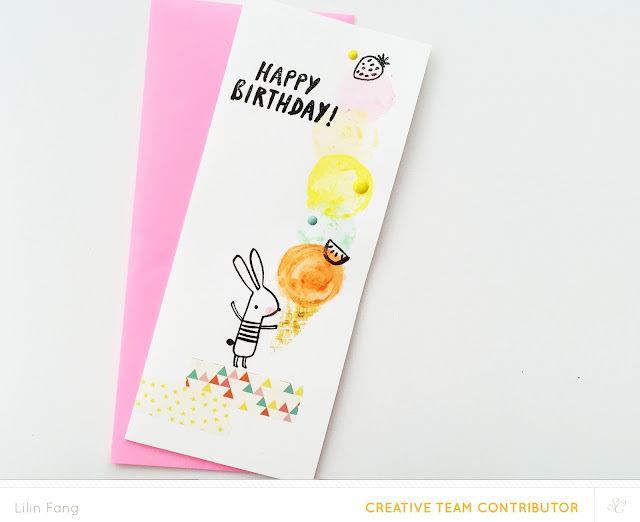 i kept the rest of the card simple and just added the bunny, the happy birthday greeting and some washi tape. thats all i have! i hope you enjoyed my little cards. 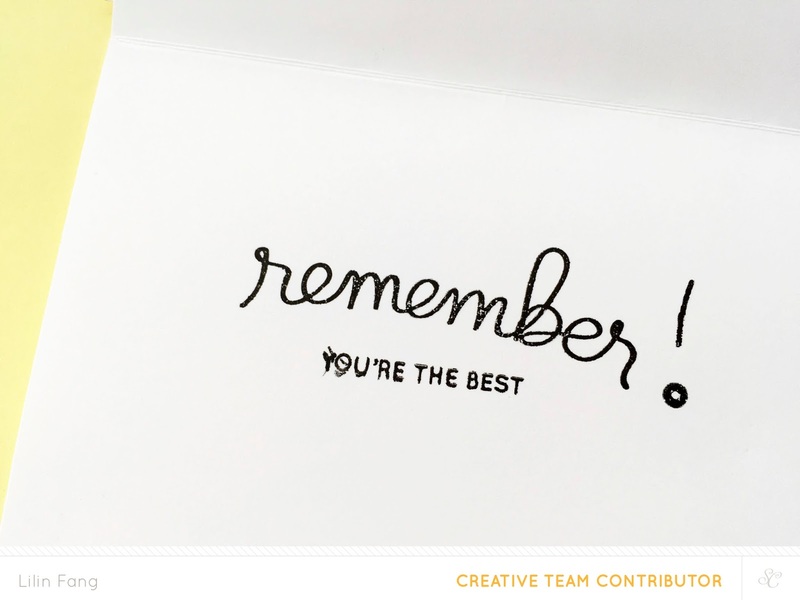 remember to check out the rest of the creative team gallery!